To comb or not to comb? Apart from styling, combing seems to be the biggest issue naturals or especially new naturals face when it comes to hair management. Combing daily is a habit most of us pick up while we have straight hair but when you become natural, it’s really not feasible to comb your hair every time you want to leave the house, not only is that too much work but for natural hair, combing can be damaging. Combing can actually damage your hair: Every time you hear a snap or tear when combing your hair, that’s hair breaking or being damaged by your comb. Of course it cannot be completely avoided however it can be limited by reducing the number of times you comb and by adjusting your combing technique. Natural hair can be managed just fine without the comb: There are many naturals who forego the comb altogether and choose to use their fingers instead and their hair is doing just fine. 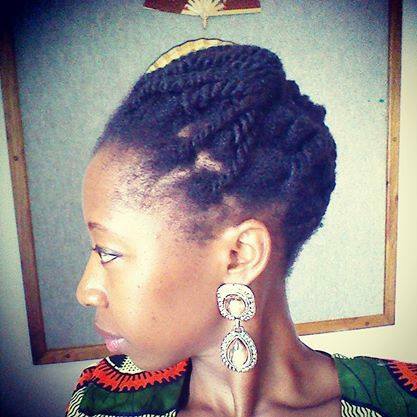 With some finesse natural hair can be managed and styled with just your fingers. So what is the correct way to comb natural hair? Here are a few tried and tested guidelines. Get a wide tooth comb (seamless if possible): Wide tooth combs run through natural hair easier because the space is more accommodating for our kinks. 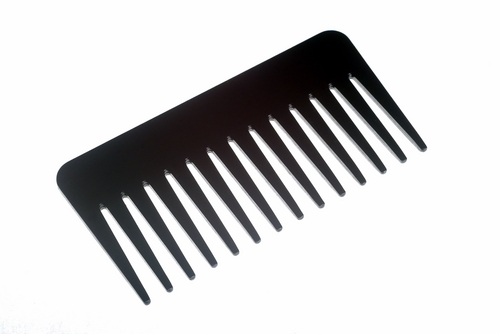 Seamless combs snag less which also makes the combing experience easier. Only comb when hair is wet or damp with oil, moisturizer or conditioner: Wet or damp hair is more malleable and takes to the comb easier. Never comb dry hair! Some people choose to comb during the conditioning stage on a wash day, others prefer to do it during the moisturizing session. Just figure out what works for you. I choose to do it while moisturizing. 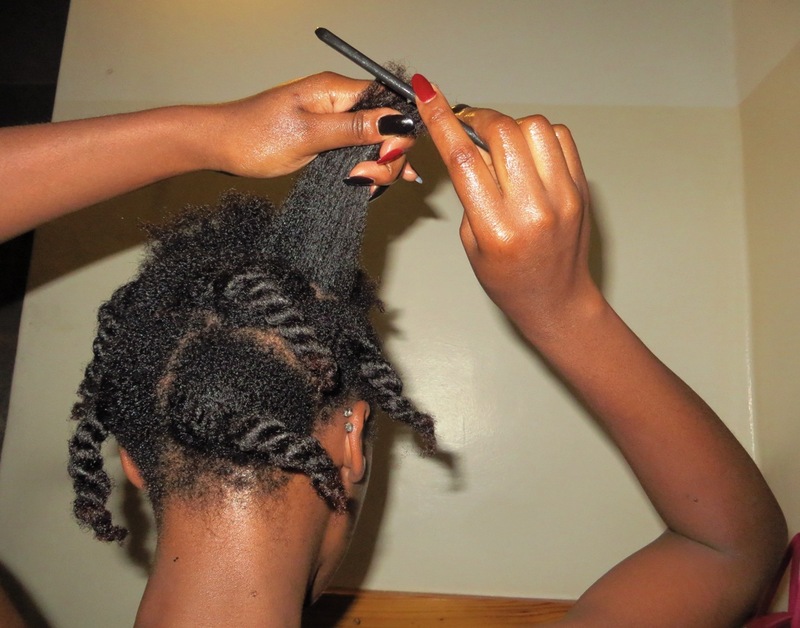 Comb in sections: It is impossible to comb the whole head at once, split it into small sections and after combing each section, put it into two strand twists to prevent it from tangling again. 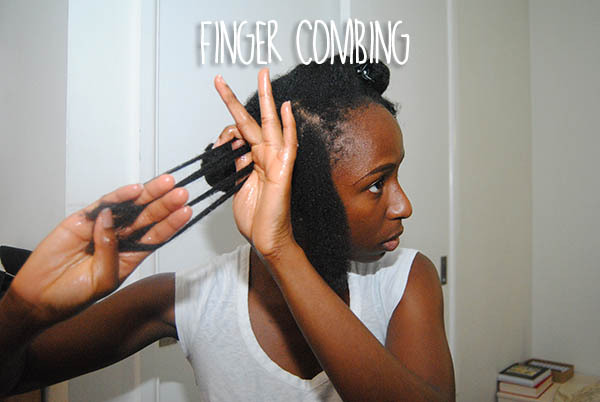 Always comb from tip down to the root: This is probably the most important aspect of combing natural hair. If you try go from root to tip, the comb will definately get stuck in a tangled mass of hair. Going from tip down to root allows you to comb out the tangles a little at a time till you reach the root. Some naturals rely soley on their fingers to get the tangles out. I have been flirting with this idea for a while however each time I try, I end up reverting back to my combing once a week routine. It’s certainly not for everyone but it does work. Basically you replace the comb with your fingers, however, unlike combing this method is certainly more time consuming and requires a ton of patience. Hair should be wet/damp and covered in a conditioner or moisturizer of your choice. Finger comb in sections. Again this is easier than doing the whole head at once. Run your fingers through the section, gently removing knots and tangles as you go along. Do not give into the temptation to pull or tear. Go over the sections twice if needed. Once may not be sufficient to remove all the knots. Put hair into twists to prevent tangling. Check out this great detailed blog post by Unrully to see how to finger comb. How often should I comb? Ideally, combing should only be done after washing and conditioning so you will most likely comb on your wash days. So if you wash once a week, you will comb once a week. If it’s once a month, you will comb once a month. The same idea applies to finger combing. If you need to comb but it’s not a washday, you will have to dampen the hair with water or a hair spray first, then continue as normal. How do I prevent my hair from tangling again? Try and keep your hair in styles that keep the hair as stretched as possible. Twists are great, nip tucked styles and even a simple puff. Styles that leave the hair “wild” and “free” like twist outs or blowouts or afros tend to lead to tangling much faster because the hair is allowed to move about and catch on itself. Additionally making sure your hair is stretched while you sleep is also essential. A puff or twists overnight will keep the hair from getting matted. Previous Post A quick new year catch up!